The likes of Simone de Beauvoir and Jean Paul Sartre altered the course of modern thought from sidewalk tables in the 6th Arrondissement. For many, Paris’s outdoor cafes are the quintessence of the poetic escape from the hum-drum routine of modern life. 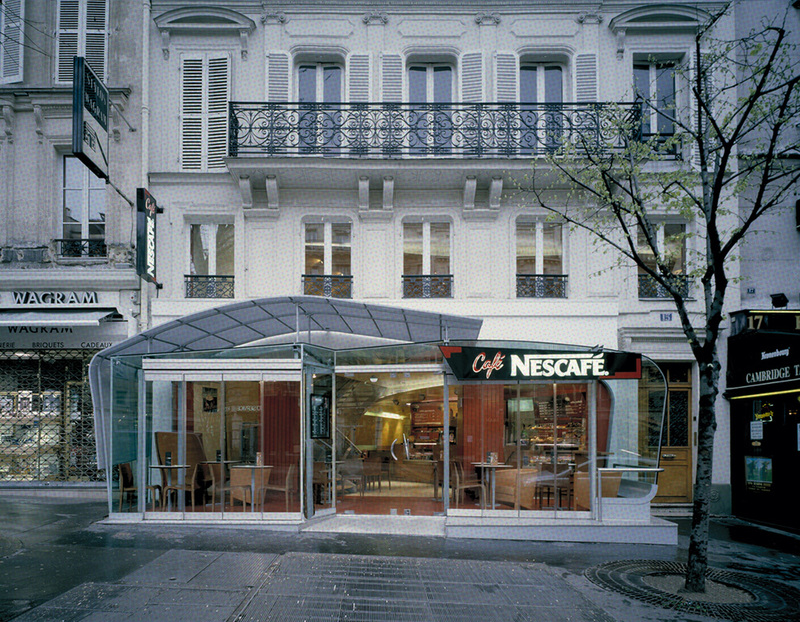 The goal of the Nescafe design was to capture this lyrical history while still creating a fully functional and adaptable commercial space. Requiring a clear brand image that could freshly compete with and distinguish itself from its existing global competitors this project addresses the question of how architecture can fashion corporate identity. 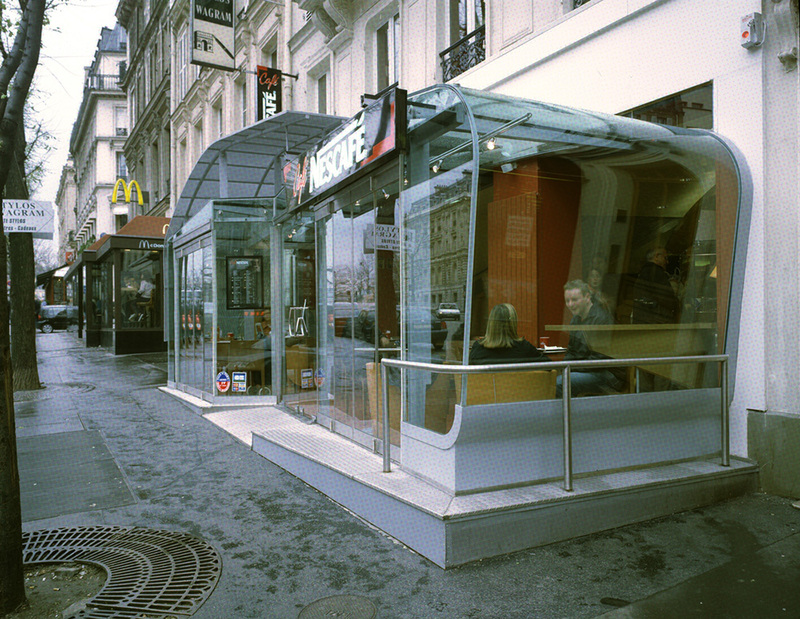 Eye-catching, but ultimately bland and cheap, fast food culture rarely fosters and encourages inventive design. Commercial chain operators are best known for their “rubber stamp” approach to architecture with cookie-cutter compositions of faux-terra cotta roofs, colored Formica counters, and plastic booths. Faced with these prevailing economies the question we were faced with was how could the design of a retail environment transcend a system where architecture is generally secondary in importance to the logo on the drink cup. Challenged by the requirement for adaptability without resorting to rubberstamping, Saee developed a flexible system composed of three variable elements: a wrapping skin, a coffee bar interface, and a graphic ribbon. The characteristics of variable components were selected for their potencies for reaction, fluctuation, and engagement with the body, site conditions, geographical forces, and commercial considerations. The wrapping skin element was co-developed in both wood and glass to encircle space enveloping the customers in a warm and inviting environment. 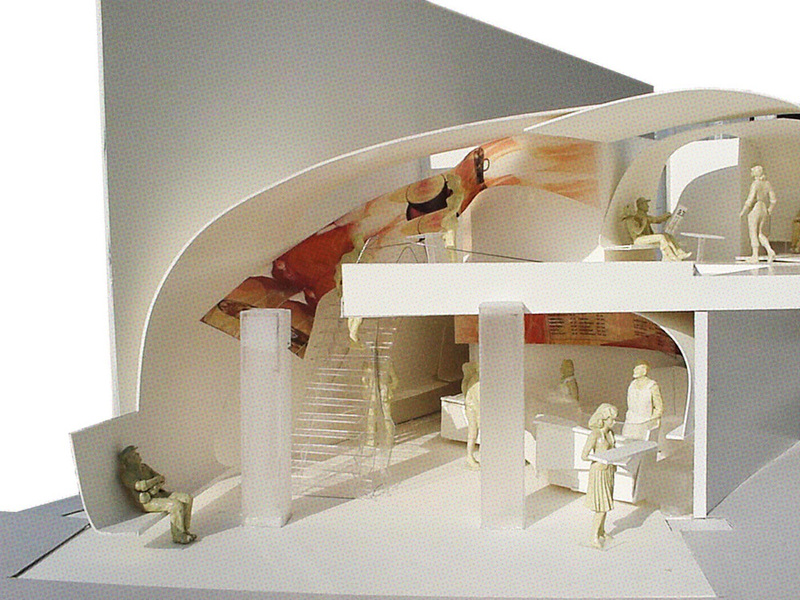 Extenuating the café spaces with an architectural finesse the skin was conceived of and developed to function as an interactive device. Capable of fluctuating and accommodating evolving circumstances the skin is in continuous flux transforming and redefining itself to accommodate the intricate variabilties of the café experience. Engaging the body as it folds to the form of a bench, or unfolding to become countertop, the spatial grammar of this element takes its cues from the movement of the body. Never straight, it bends and curves channeling activity while simultaneously reflecting light. The graphic ribbon undulates dancing with the skin to create a graphic superstructure as a backdrop for the required product branding images. Rather than resorting to picture frames and posters placed a wall, Saee created with the ribbon an architectural element capable of both functioning both graphically and spatially in the definition of areas and micro-zones. 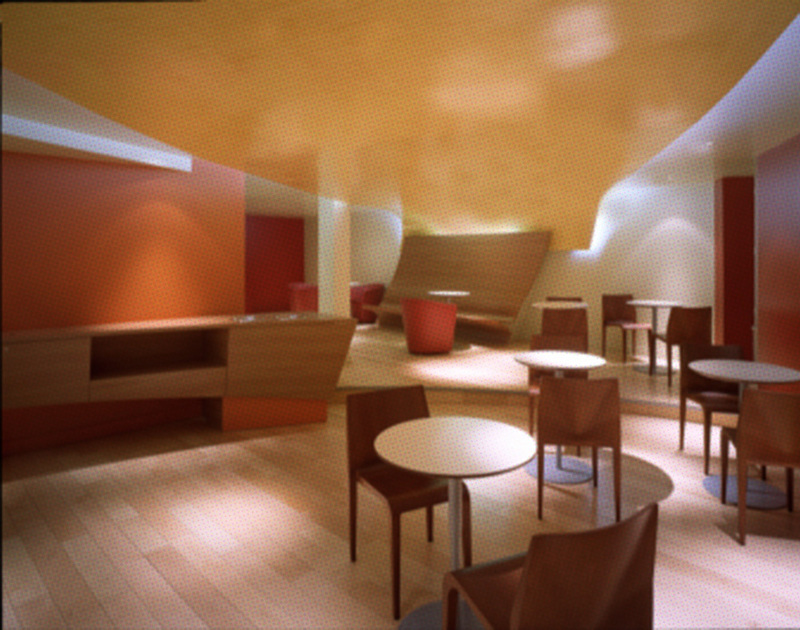 In the same manner as the skin element, the ribbon follows and redirects the currents of the café experience. 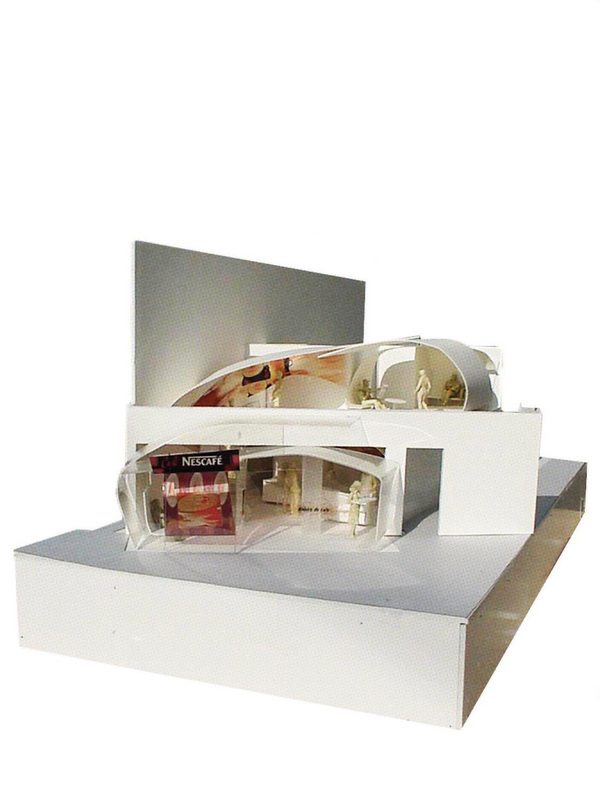 Architecture and graphics collapse into a malleable fluid. 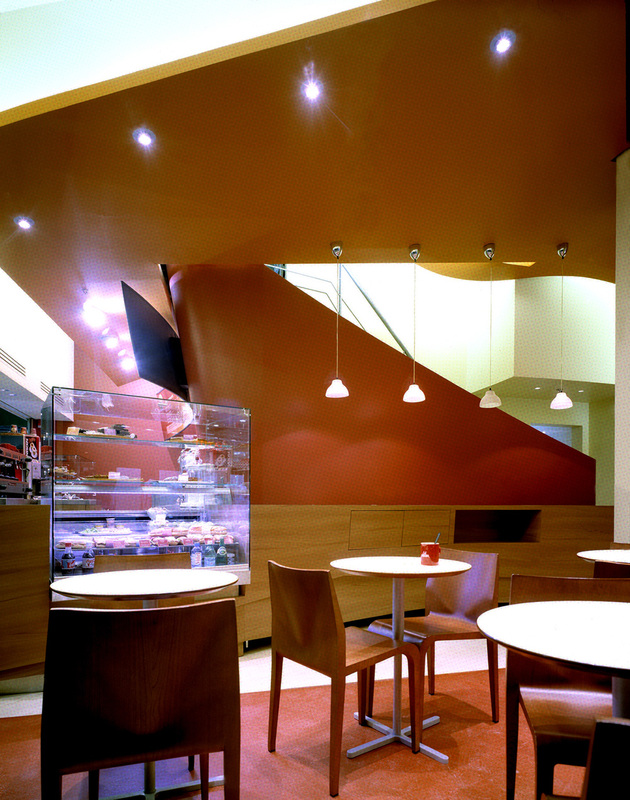 The coffee bar interface is the main physical intermediary between the product and the consumer. Unlike the other two variable elements, it has is a definitive edge dividing specific zones as a boundary condition. To soften this rigid edge condition, the coffee bar fluctuates and bends responding to a sequence of micro-activities: selection, pay, wait, receive, adjust, consume, allowing itself to be formed by the trajectories and forces of the specific activities. Functioning as a complex hybridization of container, display, interface, and boundary it functions as an anchoring force within the composition. Not about form or figure, the elements act as architectural devices which function and operate as they address and influence performance, interaction, and experience. While autonomously each element manifests its own unique qualities, together the components work as a coherent system. Rather than structured through placement, adjacency, and juxtaposition the elements instead interact intertwining formally and qualitatively. Creating a medley of diverse tonal environments within the space, each café patron will find a place suitable to their mood and personality. 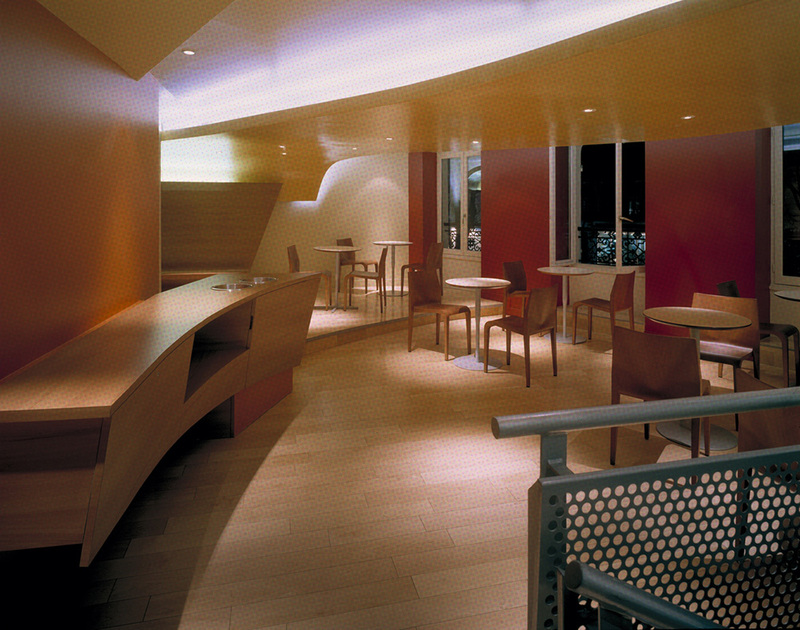 The orchestration of the three elements forms an adaptable space that gracefully embraces both the functional and ambient requirements of café culture. In doing so it manifests an innovative architectural design as it evokes the lineage of Parisian café’s creative history.